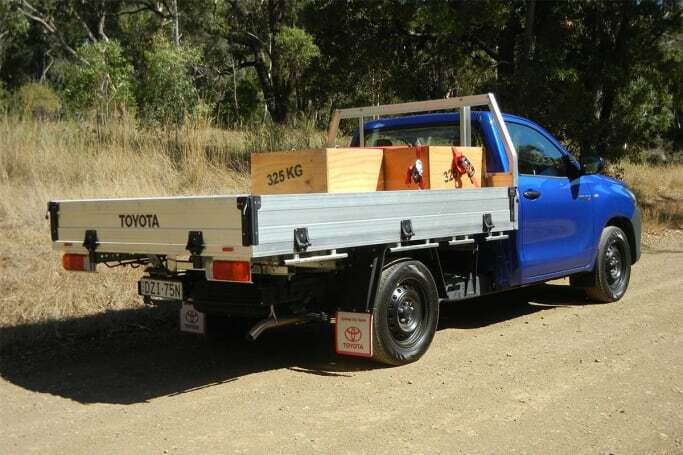 Is the HiLux still a tradies' favourite workhorse? If you’re wanting a one tonne ute that offers the highest payload and/or load length, the single cab cab-chassis is usually the way to go. Compared to dual cab or extended cab variants, the single cab allows the longest tray body for a common wheelbase. 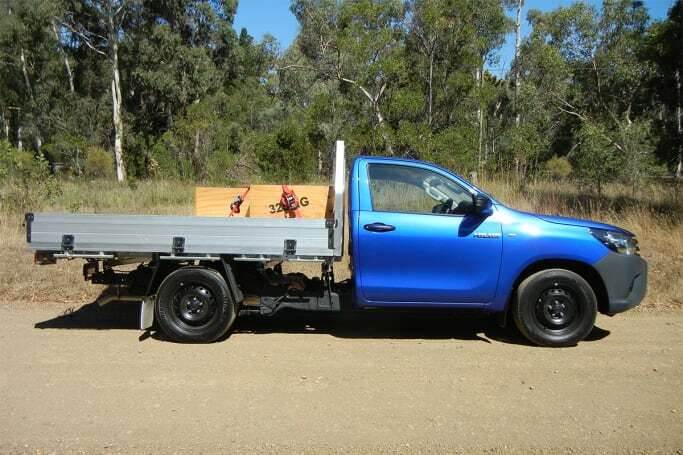 As a result, your typical 4x2 single cab cab-chassis is an unashamedly work-focused vehicle that’s built down to a price that appeals to government and commercial fleets, tradies and others needing an affordable and hard-working business partner. As the runaway leader in 4x2 light truck sales in Australia, we recently put Toyota’s HiLux one-tonner to the test to find out why it’s so popular. Our test vehicle was the 4x2 WorkMate single cab cab-chassis with 2.4 litre turbo-diesel and five-speed manual for a list price of $24,990. That's cheaper than Ford’s 4x2 Ranger XL equivalent (2.2L diesel/6-sp manual) at $27,990, but more expensive than Mitsubishi’s 4x2 Triton (2.4L diesel/5-sp manual) at $22,490. Fitted to our test vehicle was Toyota’s general-purpose aluminium (GPA) tray, with hinged drop-sides, rear window protector frame and mudguards, which costs an additional $1889.95 RRP. So combined with ORCs you could probably haggle a drive-away deal for around $30K. 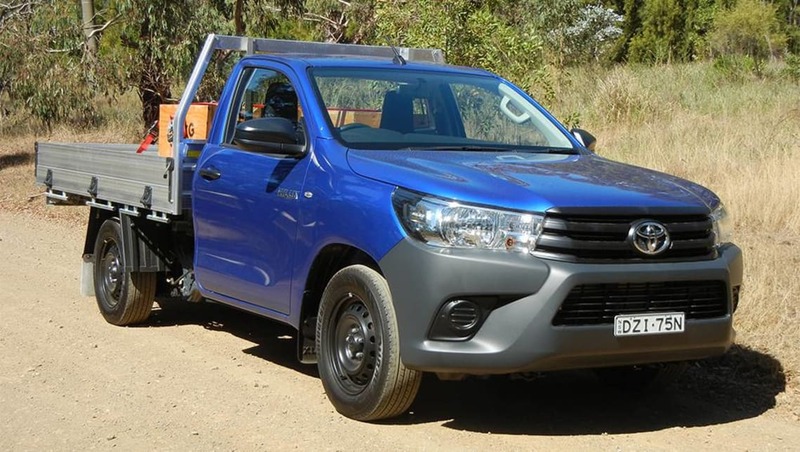 This worker is as basic as you can get in a HiLux, starting with 16-inch steel wheels with 215/65R16C light truck tyres and a full-size spare. Inside there’s vinyl floors and basic cloth-trim seats, with no rake adjustment for the base cushion, no lumbar adjustment in the backrest and limited reclining room. And the steering wheel is only height adjustable. 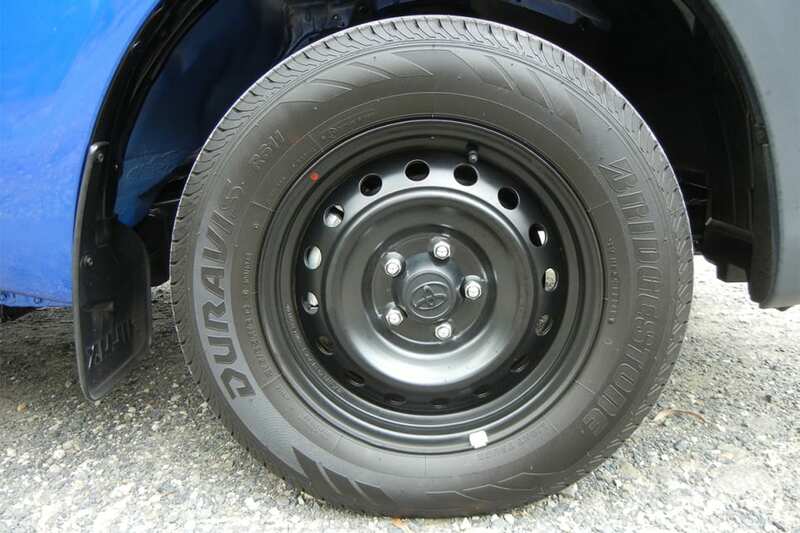 The workmate comes with 16-inch steel wheels. Underneath the tray is a full-size spare tyre. However, it does have features designed to make a hard day’s work easier, like power windows and door mirrors, manual air-con, remote keyless entry, non-radar cruise control, 12-volt accessory socket, two-speaker multimedia system with 6.1-inch control screen, multiple connectivity including Bluetooth and steering wheel-mounted audio controls, plus numerous places to put stuff. This worker is as basic as you can get in a HiLux, but in side there's at least a 6.1-inch touchscreen. You don’t get the latest trapezoidal grille design found on more upmarket grades and many items are finished in cost-saving black including the grille, lower front bumper section, door handles, mirrors and steel wheels. And there are also conspicuous blank inserts in place of missing higher-grade features like front fog lights and numerous buttons and switches. The lower front bumper section, door handles, mirrors and steel wheels are all finished black. Sadly, it also has the same annoying multimedia touchscreen shared by all HiLux models. It quickly turns opaque with fingerprints and simple tasks, like adjusting the volume, can be as distracting as trying to use a mobile phone or tablet while driving, which is illegal of course. The large door mirrors are well located and there’s ample vision through the rear window with an empty tray. However, you certainly miss a rear-view camera and parking sensors when the window is blocked by a tall load. Comfort is adequate for a single cab and big blokes can find a workable driving position, although reach adjustment on the steering wheel and a large left footrest would be welcome additions. While there's ample vision through the rear window you certainly miss a rear-view camera and parking sensors. One of the HiLux WorkMate’s enduring strengths is Toyota’s 2GD-FTV turbo-diesel engine. Quiet, refined and willing in response, it’s the smaller capacity 2.4 litre derivative of the 2.8 litre 1GD-FTV designed with lower upfront and operating costs in mind. The 2.4 produces 110kW at 3400rpm and 343Nm of torque across a broad 1400rpm band between 1400-2800rpm. With automatic transmission, that figure increases to 400Nm, so the 2.4 is clearly a low-stressed unit with long service a priority. The turbo-diesel four-cylinder makes 110kW/343Nm. The manual gearbox is only a five-speeder. However, its short 4.3:1 first gear is fine for getting heavy loads underway while its over-driven fifth, combined with relatively tall 3.6:1 diff gearing, allows the 2.4 to cruise comfortably on the highway. Toyota claims a combined average of 7.7 litres/100km but our figure, calculated from fuel bowser and tripmeter readings after 531km of ‘real world’ testing, worked out at 8.9 litres. That was impressively close to the lab-based official figure and excellent for a one-tonner. Based on our numbers you could expect a big driving range of close to 900km from its 80-litre tank. The 1570kg kerb weight and 2810kg GVM results in a sizeable 1240kg payload rating. 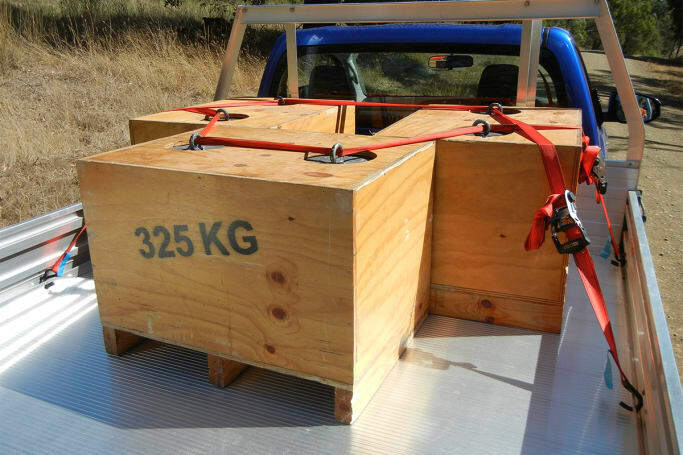 And when you deduct the weight of the 140kg aluminium tray from that, it still leaves 1100kg of load capacity. It’s also rated to tow up to 2500kg of braked trailer but with its 5280kg GCM (or how much you can legally carry and tow at the same time) the payload limit drops to 1070kg. In other words, to tow 2500kg you only need to reduce GVM by 30kg - a very practical set of numbers for a wide variety of work applications. 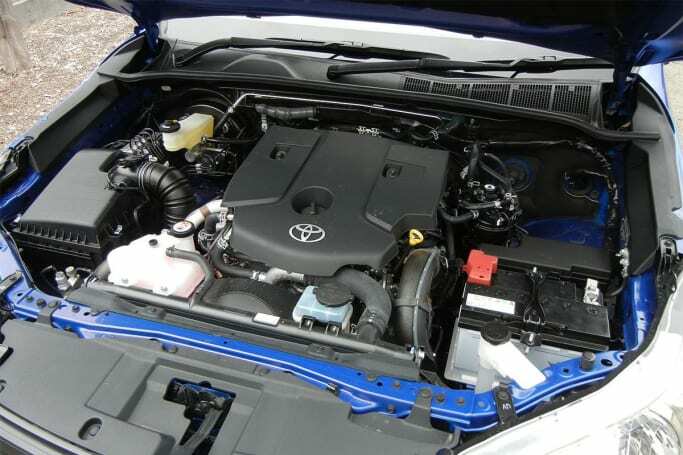 The Toyota aluminium tray is (internally) 1777mm wide and 2550mm long. It features rattle-free drop-sides plus a robust rear screen protector, which surprisingly lacks pivoting load retainers at the top on each side which are ideal for ‘book-ending’ long lengths of timber, PVC pipe, copper tubing etc. Even so, there's heaps of tie-down points. Internally they total 16, provided by aluminium rails along both sides which sit inboard of the drop-sides, with eight holes in each for securing ropes or tie-down hooks. There are also four rope-rails beneath the floor on each side, for external load anchoring if required. Although it’s a single cab there are numerous storage options, including a bottle holder and open bin in each door, pop-out cup/bottle holders on each side of the lower dashboard, two glovebox compartments (the lower lockable) and an overhead glasses holder. 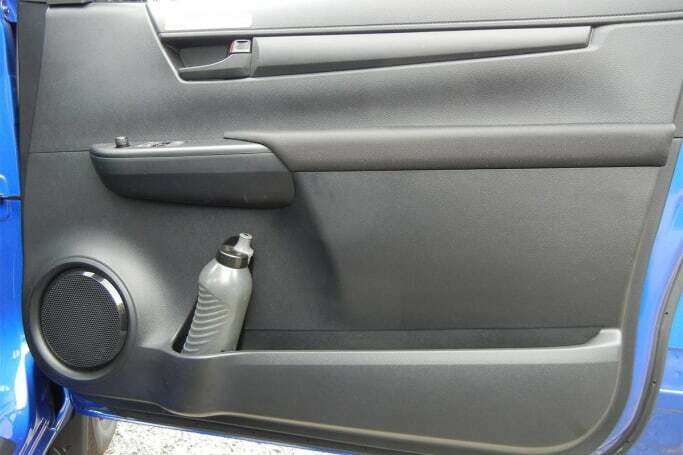 There’s also a centre console unit with an open storage bin in front of the gear-stick and another beside the handbrake, plus two cup/bottle holders at the back. Each door has a bottle holder and open bin. What’s it like as a daily driver? 6/10? We’ve never ridden a bucking bull in a rodeo, but our test vehicle’s ride when empty provided a pretty good simulation of it. The leaf-spring rear suspension was so firm and the unladen tray so light, at times it felt like there was no suspension at all, resulting in many hard thumps in the lower back when driving over bumps. And the bigger the bumps, the harder the thumps. It didn’t take long to become fatigued by this, particularly on corrugated dirt roads and heavily-patched bitumen back roads used during our test. So if you want to avoid the chiropractor, best cure is a decent load over the rear wheels. Therefore this vehicle would be best suited to work applications that require either lots of heavy lifting, or a custom-built tray that's permanently loaded with heavy tools and/or equipment. What&#039;s it like for tradie use? 8/10? What's it like for tradie use? 8/10? We secured 975kg on the tray, which with our 100kg driver was just under the 1100kg payload limit. 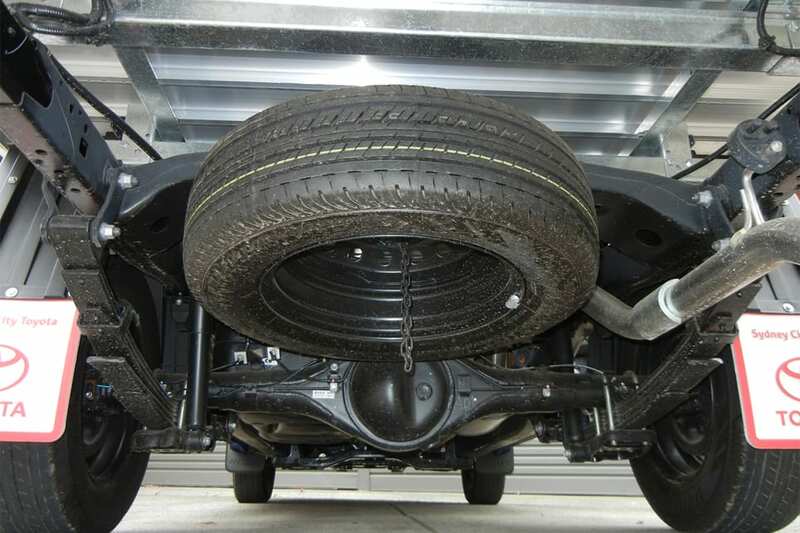 With the bulk of this load ahead of the rear axle line, the rear springs only compressed 45mm (with more than 50mm of bump-stop clearance remaining) and the nose dipped 21mm, resulting in a near-level ride height. Not surprisingly, the harsh unladen ride quality was transformed, as the rear suspension is primarily designed to lug this weight. The ride was still firm but much smoother, soaking up bumps and corrugations with ease and with little effect on steering feel and braking. We secured 975kg on the tray, which with our 100kg driver was just under the 1100kg payload limit. The engine’s broad spread of torque combined with well-matched gears provided energetic performance with or without a load. In top gear on the highway it cruised along within its peak torque zone, with 2300rpm at 100km/h and 2500rpm at 110km/h. It was surprisingly quiet at these speeds but some wind noise was noticeable around the door mirrors and rear window protector frame. There was also an intermittent buzzing sound, like a high frequency vibration, coming from somewhere within the cabin at speeds above 100km/h, which became annoying after a while. At maximum GVM it coped easily with our 13 per cent gradient 2.0km set climb, maintaining the 60km/h speed limit in third gear at 2400rpm on light throttle. Engine braking in second gear on the way down was good but not great, requiring a stab or two of the brakes to stop it spinning past the 4400rpm redline on overrun. Not bad for a 2.4-litre turbo-diesel, but the Triton’s 2.4 had stronger retardation under a similar load. Maximum five-star ANCAP rating when last tested in 2015, but without AEB it would lose at least one of those stars if tested now. The vehicle stability control menu also lacks trailer sway control which would be desirable given its GCM. There’s also front and side airbags for driver and passenger. Five years/unlimited km warranty. Scheduled service every six months/10,000km whichever occurs first. Specific model capped-price servicing of $240 quoted for the first four scheduled services over 24 months /40,000km whichever occurs first. It’s a basic work truck that’s short on features but big on load-carrying ability, with a genuine one tonne-plus payload rating. However, as a direct result of that, it also has the harshest unladen ride we’ve experienced in a single cab cab-chassis. 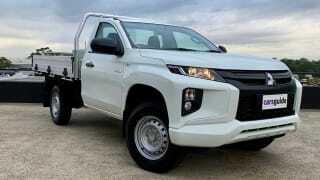 Would you have a HiLux over the new Triton? Let us know in the comments. 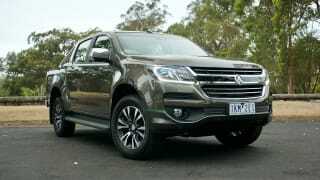 The Holden Colorado 2018 range is extensive, with multiple variants to choose from. There's no petrol model, which could be a concern for some.